As a resident passionate about issues facing his local community, Barry Palta decided to form an association with people who shared his passion to make a difference and work together for the local community's welfare. 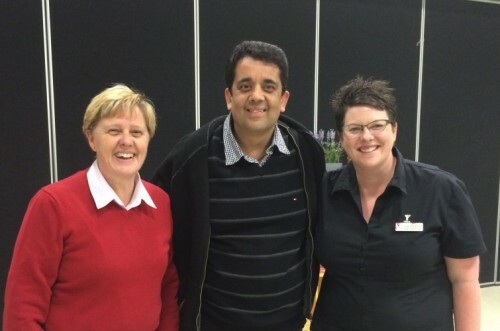 The Derrimut Residents Welfare Association (DRWA) was formed in February 2014. They received a $2000 Establishment Grant as part of the 2014 Brimbank Community Grants. DRWA now has 20 members who meet every month to address the most pressing issues facing the community and then find ideas, suggestions, and strategies to solve them. The DRWA's main objective is to make diverse community members feel welcome and included. It also encourages residents to participate and become actively involved in their community programs. DRWA has worked closely with Brimbank Council to address issues at Balmoral Park in Derrimut, such as inadequate seating, inadequate lighting, litter, and lack of dog signage. Brimbank Council's Director of Infrastructure, Director of Leisure, and Director of Community Wellbeing visited the park with DRWA and saw first hand the park's lack of facilities. They decided to install better lighting, benches with back support, and proper dog signage. This has made going to the park a more enjoyable, safe, and happy experience. The DRWA is trying to reduce loneliness and isolation by addressing barriers that stand between disadvantaged residents and active community participation. This can counter issues such as lower productivity, chronic health problems, welfare dependence, and fractured communities. "There are many people who are living alone and struggle to get out of their homes. Social inclusion is our priority. We want to ensure that residents can participate fully in community life" Mr Palta said. As part of the Neighbourhood House Week 2015 the DRWA and YMCA Community Centre organised an information session by the Neighbourhood Watch Program about safe practices in the community. About 20 people attended but the outcome was the formation of a Neighbourhood Watch Program for the Derrimut area. "I really enjoy interacting and working with people from diverse communities to address issues that face us at a local level and then to find ways by which we can address these issues. I also get to learn so much from other people’s insights, knowledge and experience" Mr Palta said. To get involved with Derrimut Residents Welfare Association contact Founder/President, Barry Palta on 0469 710 319.